On Monday, May 13, 2013, 9 Wing Gander presented a cheque for $2000 to the Gander Heritage Memorial Park. Our appreciation and thanks to 9 Wing Gander and all those who contributed to this effort. In attendance were: Far left - CWO E.Burns, Nigel Summers, Personnel Support Programs Mgr. Members of the Committee, Left to Right: Joy Janes, Bill Kelly, Betty Burt, Wilson Hoffe, Pat Brazil, Clyde Burt, Betty Ireland, Carol Walsh and Lt. Col. G.Thibault, Wing Commander. As of May 13 2013 we now have an updated Donations page and an updated Donations Progress Bar with an updated Ticker on the right. to jump to the updated Small Business Donors, Organizations and Fund Raising Efforts section. We now acknowledge donations made In memory of. The committee is looking at a plaque of some type to be permanently mounted at the Gander Heritage Memorial Park site acknowledging these individual donations. Both PayPal and the Town of Gander have no means of recording the donation made In memory of. If you want your name to appear as a donor In memory of on this website please email our Site Administrator Gerard at gerard.mccarthy.99@gmail.com or Committee Member Maxine at maxine@briggsaero.com and your donation will be recorded as such and will be shown as In memory of. If you don't want your name to appear as a donor on this website please email our Site Administrator Gerard at gerard.mccarthy.99@gmail.com or Committee Member Maxine at maxine@briggsaero.com and your donation will be shown as anonymous. We now have an updated Donations page and an updated Donations Progress Bar with an updated Ticker on the right. to jump to the updated Small Business Donors / Individual Donors sections. As we sit here on Little Cobbs Pond, looking at the ducks - pretty sure they are the babies from last year, I can't help but ponder on the day our small committee took on the Reunion of all early children of Gander held in the summer of 2010. Protestants and Catholics together - first in our history! We have had reunions of individual schools, but as far as I know never both Catholics and Protestants with the one combined Reunion. Our very small committee of Carol Mercer Walsh, Joy Mercer Janes, Betty and Clyde Burt, Bill Kelly (former teacher of St. Paul's), Maxine Wicks Smith, Wilson Hoffe, Roy Sceviour (who was the rock of our committee, but so sad he had a stroke just months into the meetings and since has passed away - what a great loss! ), Betty Ireland and Pat Power Brazil. We had a plan but little did we know it was a big undertaking but well worth the work! We reminisced with people not seen in 50 years -- the Fitzgerald's from Balbo Street had a big show from their family, Leo hung out with them on the old army side when he was soooo young - in particular, Steve, Lorne, Myles and Geraldine; the Malone sisters, Sharron and Sheila added to the fun; my brother George - good friends with Gerry Malone who unfortunately couldn't make the reunion; Marion and Lorraine Wheeler (their brother Warnie - another friend of Leo's was too ill to attend the reunion). So good to see Brian Goff, Louise Oates, Morley and Kevin Smith (all the girls had such a crush on Kevin, he never gave us a look), Hudson and Bonnie Ramsay, Gracie and Dorothy Ricketts, Judy and Jim Garland, Cathy Hogan, the Coughlin girls (still looking so good), Rosemary Myrick, Ed Locke, the Maloney girls, Dave Robertson, Jeanette, Leo and Marie Lannon, Kathryn and Deedee Lannon, and so many I can't remember off the top of my head. I'm sure everyone remembers (Elias) John Hollohan and the Reunion song he composed and sang! A special thanks from me to Gerard McCarthy. Gerard and I graduated together. He is relentless in the work he has done for us. What a time we had – the tour of the old Army Side being a most memorable day and the "grand finale" at the old Terminal. (Ross Patey couldn't make the reunion but he visited us at the terminal. Thanks Ross for your very generous donation. Hopefully when we have a grand opening we will see you back home again.) Then the weekend ended with the emotional Memorial Service officiated by Rev. Marion Pardy, Rev. Bill Noel, Sister Brendan Lynch and Sister Betty Quinlan. 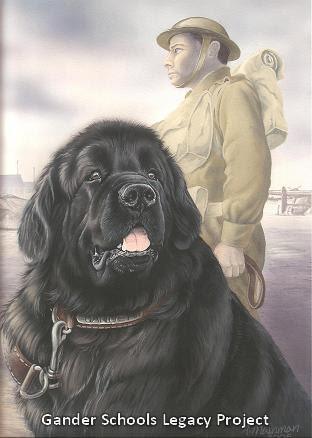 But even before the Reunion was over our little group had made a commitment to leave a legacy from our generation to future generations and had decided on a statue of the famous Newfoundland dog "Pal" also known as Sgt. Gander and thus came the conception of the Gander Heritage Memorial Park. We were at the site of the new Park today to accept a very generous donation and Betty Burt put it all in perspective when she said "Pat, the average age of our committee is 70 and even older". We've come a long way baby since 2010 when we planned the three-day Reunion and now we have raised over $357,000 of the needed $450,000 - not bad for a few old timers! Thank you so much to family and friends who have so generously donated to the Park. I am so excited with Reverend Wesley Oake coming on board as our Honourary Patron. We are so honoured to have him, a World War II decorated veteran. He will be 91 on May 31st and plans to parachute from an airplane at 9,100 ft., one hundred for every one of his 91 years. If anyone is interested in making a pledge to Rev. Wesley Oake's brave jump or making a donation to our cause, please visit our site or contact me or one of our committee members. The Winged Victory is presently with Morgan MacDonald for a very extensive repair. Visit his web site at The Newfoundland Bronze Foundry. Along with the statue of Sgt. Gander and his soldier/handler, we will be adding to the park with the 125th Newfoundland Squadron of the Royal Air Force Wall of Honour, other monuments to the Ferry Command, a Compassion Monument of 9/11 and plaques commemorating past aviation disasters which occurred at Gander. Wouldn't it be great if all the 2010 Reunioners were here for the Grand Opening of the Park in September 2014 ---- Just my thoughts! It’s our pleasure to announce that Rev. Wesley Oake has kindly consented to be Honourary Patron for the Gander Memorial Heritage Park. Rev. Oake is a veteran of WWII having served with the 166th Royal Newfoundland Field Artillery Regiment overseas in England, Africa and Italy. He was ordained a minister with the United Church of Canada in 1965 and had ministries in Newfoundland and Ontario before semi-retiring in 1987. Born in Beaumont, Newfoundland, he now resides in Gander with his wife, Myrtle where he is very active in the community. Rev. Oake is celebrating his 91st birthday on May 31st and to assist us with fundraising and in commemoration of his birthday, he is planning to parachute from an aircraft over Gander at 9100 feet and is hoping to raise at least $100.00 for each 100 feet. Rev. Oake would greatly appreciate your support and we encourage you to be a sponsor for this courageous gentlemen. [Gerard] In searching for something on Rev. Oake I came across this Gander Beacon newspaper atricle published on November 10 2011 titled Coffee With...Wesley Oake. Let's all support Rev. Oake in this very brave feat. Contact any member of the Gander Heritage Memorial Park to be added to the pledge sheet. All members names and contact information are on the Contacts page. Inactivity on our website is in no way indicative of inactivity at The Gander Heritage Memorial Park. The committee is meeting monthly, and sometimes more frequently, and huge strides have been made in the detailed plans and design specifications for the Park. The Design Consultants, DMG, have now completed the blueprints and soil samples. We have met with Wareham’s Construction and they have now staked and roped off the park and advise they are ready to move. It is hoped that, if Mother Nature co-operates, equipment will be on site in less than a week and we’ll have photos of the sod turning! We currently have several fundraisers ongoing and will update you in the next few days on some very important announcements. A report from sculptor Morgan McDonald indicates that the repairs/refurbishment of the current cenotaph Winged Victory are on schedule and the statue will be returned and installed well in advance of the ceremonies scheduled for July 1, 2013. On a cold, snowy, and windy day in December 2012 the cenotaph Winged Victory is removed from her pedestal at the War Memorial for transport to St. John’s for repairs and refurbishment. Thanks to the Town of Gander staff for their assistance. The following is an extract of Morgan’s progress report. We invite you to view more of the spectacular work by this sculptor by visiting his website The Newfoundland Bronze Foundry. The sculpture has undergone a thorough cleaning to remove all oxides and dirt. After many years of being in place the sculpture has accumulated significant amount of oxidization and other environmental corrosion. Throughout the sculpture there are a number of holes in the bronze. Major incidences of porous gas holes from the original casting will be repaired to seal it from the environment and to improve the cosmetic quality of the bronze. There are numerous areas of this throughout the piece. This will be remedied as much as possible without affecting the artistic integrity of the piece. There are join lines visible on the wings, arms, back and base, these will be re-welded and refinished to eliminate the cracks and seam lines. Any welding throughout the statue is to be re-textured. This operation is a finely detailed craft. A support structure on the inside of the statue will be created also known in sculptural terms as the "Armature". This will be used to create a suitable mounting base for the statue. Patina is the final finishing touches made on the appearance of a bronze and is the most important step in the process of restoring the Winged Victory Statue. It is ultimately the colour & final look that the statues will take on. Winged Victory will be patinated using ferric nitrate and liver of sulphur compounds. The very last step in creating a bronze sculpture is to apply a coat of wax. Your sculpture will have many coats of wax applied. This is usually done when the metal is still warm and allows for the wax to enter the pores of the bronze. The wax acts as a barrier to the air and humidity that can cause the bronze to oxidize and turn green. We have also commissioned Morgan McDonald to complete the sculptures of Sgt. Gander and his soldier/handler.